Check out this preview of CAHS' Annie E. Casey Kids Count Report, which analyzes how place and race influence how children and families fare, looking at data based upon geographic location and race. In order to do this, CAHS used data samples from five Public Use Microdata Areas (PUMAS) in Connecticut. Birthweight correlates with a child's future development and health. Children born under 2,500g (5.5lbs) are considered to be low birthweight, and have a high probability of experiencing pre- and post-natal developmental problems, short- and long-term disabilities, and are at a greater risk of dying within the first year of life. Place plays a role in the prevalence of low birthweight births, but that role differs by race and ethnicity. For all groups, the highest rates of low birth weight were recorded in the Urban Core and Urban Periphery PUMAs, while the lowest rates occurred in the Rural and Wealthy PUMAs. While economics is clearly a central factor in this variance, it is likely not the sole factor: while the Wealthy PUMA has the highest median income among the PUMAs and the Urban Core the lowest, the Rural PUMA's median income is comparable to that of the Urban Periphery. We find persistent differences in birthweight by race and ethnicity within and across the "Five Connecticuts." Despite their varying (but often low) distributions in a given region, Black babies almost invariably had the highest rates of low birthweight overall, whereas White's rates were often the lowest. Blacks' highest recorded rate of low birthweight, 13.8%, was recorded in the Urban Core, as was Hispanic's highest rate of 9.2%. Whites' rates, by comparison, only reached above 7% in the Urban Periphery, similar to the levels for other groups. 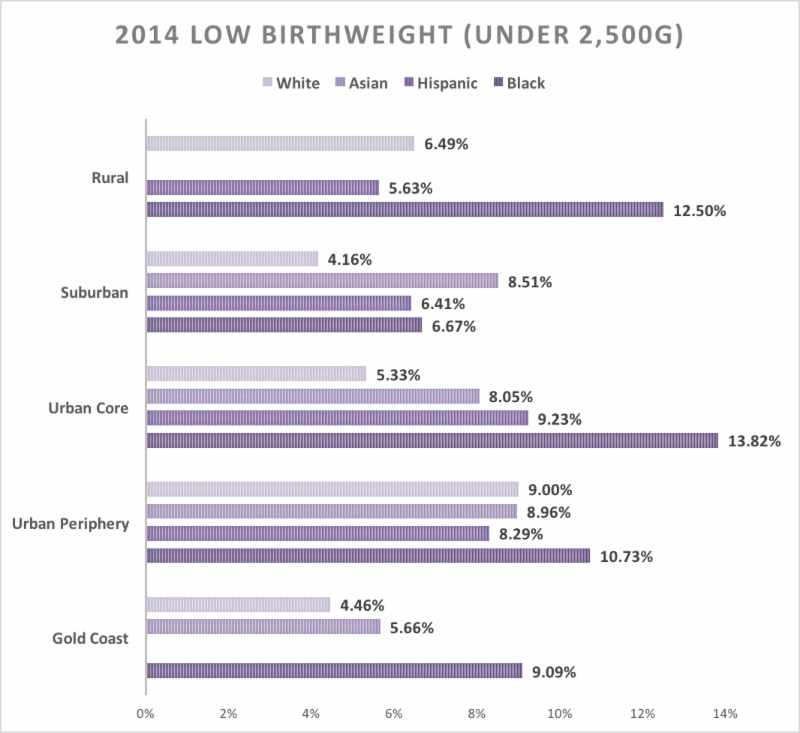 Across most measured PUMAs, Asians' rates of low birthweight are generally higher than Whites, and in the Suburban PUMA, Asians led all groups at 8.5%, while Blacks recorded their lowest rate of 6.67%. Stay tuned for details of the release of the full report in the coming weeks. 5. Rural PUMA- Ashford, Brooklyn, Canterbury, Chaplin, Eastford, Hampton, Killingly, Plainfield, Pomfret, Putnam, Scotland, Sterling, Thompson, Woodstock, and Windham.